If you can get past the fact that peeling them can be a bit labourous at times, you are treated to a sweet tasting, vibrant and versatile vegetable that generally passes muster with most people. It’s generally not one of those vegetables that people are known to turn their noses up at, unlike perhaps this, so it’s a great vegetable to feed the whole family. It’s bright, vivid colour is clealy a mood enhancer and with all this terrible weather we have been having lately, I welcolme it wholeheartedly into my cooking. I love all manner of lentils and pulses and cook with them most days in some capacity. This dish I cook in bulk and then eat over a few days. It stores well in the fridge, although I tend to keep the feta seperate until ready to serve, as I find it tends to crumble if I mix it in too early with the other ingredients. As with all my recipes if you are feeding it to your young children I omit the chilli. The dish has some wonderful flavours going on, that combined together works really well. I sometimes add pomegranate seeds and had planned to put them in, but somehow managed to forget this time around. So if you fancy throwing in another bright colour to make the dish even more cheery and summery then add some pomegranate seeds. 1. Preheat an oven to 180 degrees. 2. Peel a small/medium sized butternut squash and cut into bite sized cubes. Place on a baking/roasting tray along with the chopped garlic cloves. Using your hands cover the cubes and garlic with olive oil. 3. Place in the oven and leave to cook for 40 minutes. 4. Rinse the lentils in cold water to give them a good clean and then place them in a pan with cold water so that they are well covered and leave on a medium heat for 20-25 minutes (see packet for details). They should be nicely softened by this stage. Drain and leave to cool. 5. Finely slice a small red onion and red chilli (de-seeded if you prefer it less hot) and cut the feta cheese into small cubes. 6. In a small bowl mix the red wine vinegar, sherry vinegar and sugar and season to taste. 7. Gently mix all the ingredients, aside from the feta, together in a bowl first. 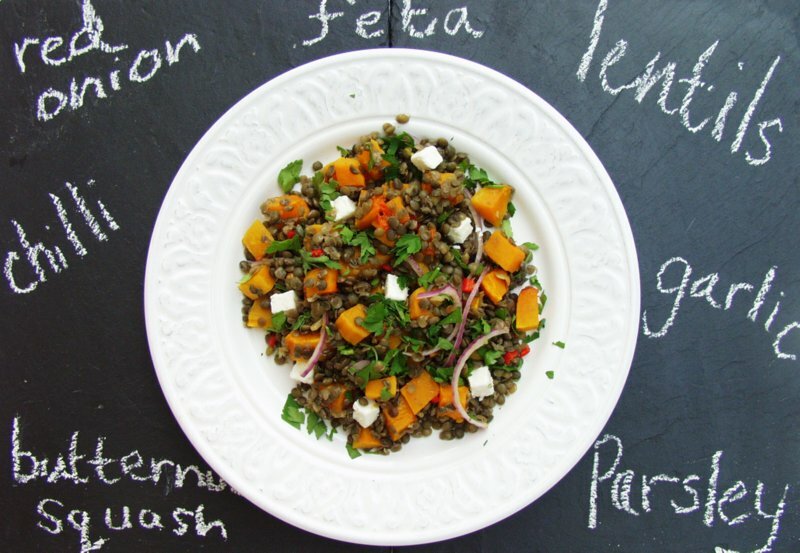 Serve sprinked with feta cubes and a generous portion of chopped flat leaf parsley. As the feta is so naturally salty you will probably find that you do not need to season with extra salt. 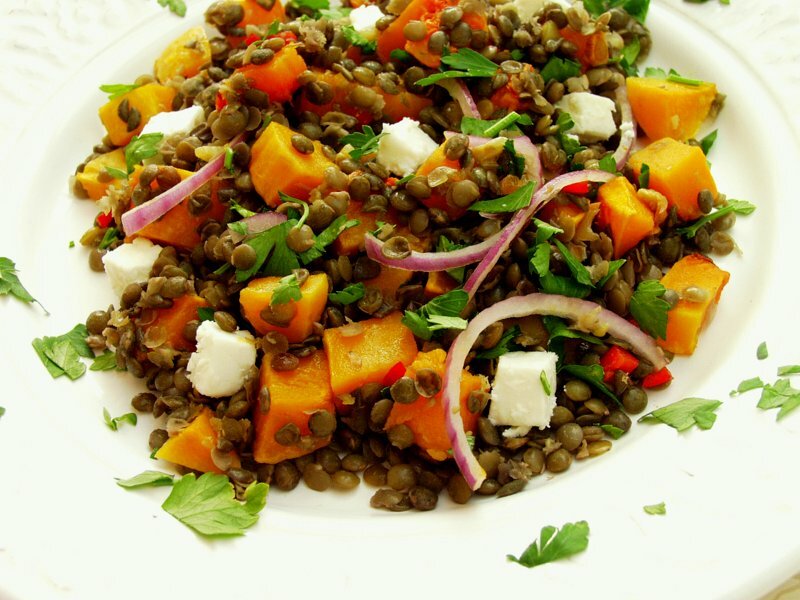 This entry was posted in Salad, Vegetable, Vegetarian and tagged butternut squash, feta, flat leaf parsley, lentils, pomegranate, red chilli, red onion. Bookmark the permalink. Looks delicious, sounds delicious. Cannot wait to try it. Thanks Al. Fresh, healthy and as always very easy. Watch out for the next blog post, you are going to love it. This looks really healthy and I like the way the butternut squash provides nice color.